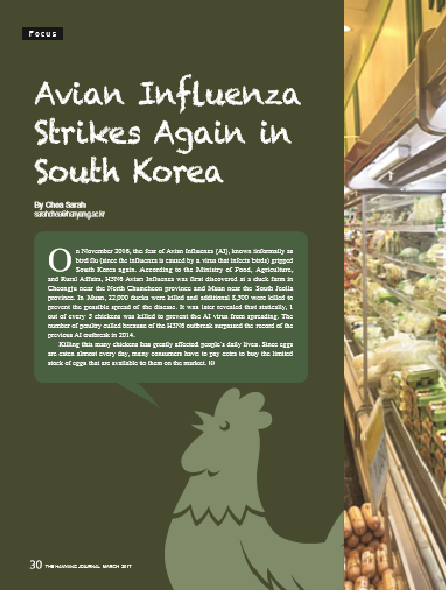 On November 2016, the fear of Avian Influenza (AI), known informally as bird flu (since the influenza is caused by a virus that infects birds) gripped South Korea again. According to the Ministry of Food, Agriculture, and Rural Affairs, H5N6 Avian Influenza was first discovered at a duck farm in Cheongju near the North Chuncheon province and Muan near the South Jeolla province. In Muan, 22,000 ducks were killed and additional 8,500 were killed to prevent the possible spread of the disease. It was later revealed that statically, 1 out of every 5 chickens was killed to prevent the AI virus from spreading. The number of poultry culled because of the H5N6 outbreak surpassed the record of the previous AI outbreak in 2014. Killing this many chickens has greatly affected people’s daily lives. 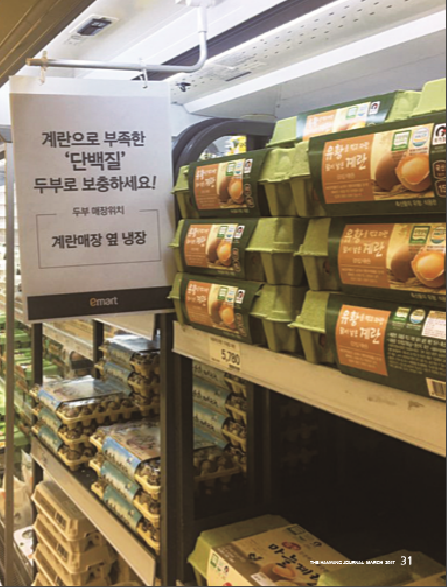 Since eggs are eaten almost every day, many consumers have to pay extra to buy the limited stock of eggs that are available to them on the market.